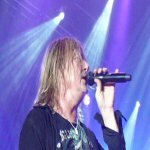 Def Leppard singer Joe Elliott was interviewed by Uber Rock to promote the Down 'n' Outz and talked about 2015 tour plans. Joe talked about The Who show, Down 'n' Outz, living in Dublin, Vivian's health, band tragedies, (the awful) VH1 Hysteria movie, the 2015 UK tour, the next studio album, co-headline tours, playing rare songs and possibly re-recording older songs like Glad I'm Alive. Joe says the 2015 studio album should be out by May and a UK tour could take place around September. Ths would be their first UK tour since December 2011. This ties in with Vivian's comments last week to fans about UK shows happening later in the year and not at the same time as the European shows that were recently announced. 10 shows have so far been announced for the 2015 world tour. The latest was a festival show in Tampere, Finland last Friday. "It's going to be next year for sure. Absolutely we're going to do a British tour next year. We do have a tentative plan for a tour, so it's just fitting it in. The album hopefully will be out about May or something like that, so the tour is probably going to be towards September or whenever. But it's so early right now and we're just trying to get it all in place." "I thought 'See The Lights' was one that could have done something or 'Glad I'm Alive'; that would be my favourite because it's got that mad sort of tribal drumming thing going on. Yeah there's a few knocking around, and they might end up on a box set one day."